Autumn is such a lovely time of the year in Tamworth and surrounds. The days are often sunny, the nights snuggly, which means it's still warm enough for salads but you don't need to think twice about turning on the oven. Last week I was fortunate to speak with Kelly Fuller and Anna Moulder from ABC New England North West about autumn eating and just a few of the lovely things in season right now. You can catch the conversation on SoundCloud. Or read on for a few of our ideas. This is a classic and well known combination for using pears, but there's one rule of thumb to ensure you get it right: use the best extra virgin olive oil and Parmesan that you can afford (and find). Ensure your rocket leaves are washed and dry, then toss in just enough EVOO to make then glisten. 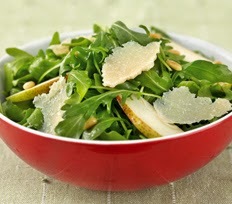 Thinly slice a just-ripe pear - you want it to be firm enough to hold its shape - add to the rocket and top with shavings of Parmesan. I find a vegetable peeler is the best way to shave from the block. If you're a texture freak, you can also sprinkle with toasted pine nuts. Don't save that expensive bottle or gift for a special occasion. EVOO is not like wine. Its flavour intensity will decrease with age, so fresh is best. Look for oil that tells you on the bottle what year the olives were harvested. Depending on the region, harvest is usually completed from April to June. Not many of us are familiar with using chestnuts, myself included, but they are in season. Not just for roasting over the fire in an idyllic nod to the northern hemisphere, they can also be chargrilled and added to a salad of leaves, pancetta and croutons. Walnuts are also in season and when it comes to salad that can mean one thing for many people: Waldorf Salad. No longer a slimy mix of walnuts, celery, grapes and apple glooped in mayonnaise, add radicchio, witloaf and celery leaves for an updated classic. Check out Gourmet Traveller for these and other autumn salad ideas. Wild mushrooms are also in season right now. If you can find someone who knows what they're looking for you might be able to convince them to accompany you on a foraging exercise. Otherwise, keep your eye out at markets for pine mushrooms, which are large, with a bright orange underside. Super fleshy, simple slice and sauté in butter. Don't be alarmed, they will "bleed" orange as you slice. Also look for porcini powder, available all year round, maybe even in supermarkets now. Sprinkle into mushroom risotto or pasta for extra richness, or coat lamb fillets before grilling. We also covered pomegranates, Jerusalem artichoke (also known as fartichokes) and chickpea salads. Here's the super simple chickpea salad I mentioned (hint: I used olive oil instead of ghee, I also skipped the spring onions as I had none).